DES MOINES, IA (TM216) — The AFC Cleveland Royals defeated the Des Moines Menace 3-1 on a wild, entertaining night of soccer between two of the NPSL and PDL’s finest. Both teams traded chances throughout the match, and were kept in the game by excellent goalkeeping performances, but the Royals proved to make the most of their opportunities and have earned a place in the Second Round of the U.S. Open Cup, where they will face the USL’s FC Cincinnati. Des Moines created more chances in the first half and seemed to keep slightly more possession, but were unable to find a way past Alex Ivanov. The Royals had opportunities as well, but seemed to reach a higher level with the wind at their back in the second half. Both sides ended the game with 8 shots on goal, though the Royals were more efficient in front of the net with three goals on 10 total shots, compared to the Menace’s one goal on 13 shots. The Menace also earned five corners to AFC Cleveland’s 2, but the Royals backline showed signs of continuing their impressive form from last season by dispatching any Des Moines set-piece chances. The first half provided end-to-end action with both teams able to go forward and create dangerous opportunities. The Menace got out to a quick start by testing Royals goalkeeper Alex Ivanov with a couple shots within the first five minutes of the match. The Menace had the best chance of the half in the 10′ when a Royal turnover in the midfield led to a breakaway for Des Moines’ Devyn Jambga, who only had Ivanov to beat. The AFC Cleveland goalkeeper was able to perfectly time Jambga’s approaching dribble to meet the ball at the time of Jambga’s shot, sending the ball wide of the post. The Royals created two chances of their own in the ensuing minutes. In the 15′, Chris Cvecko beat a defender in the air before sprinting to the corner to place a cross that was ultimately turned away for a corner kick. Two minutes later, Tom Beck forced a turnover deep in the Menace’s defensive third, which led to a dangerous cross that would have met an open Ben Truax if it had not been intercepted by Des Moines keeper Kyle Ihn. Play stopped in the 23′ as trainers attended to Mike Derezic, who suffered from an apparent injury and was replaced by Coletun Long. Des Moines continued to shoot at the AFC Cleveland goal for the remaining of the half, but their chances were kept a safe distance from goal and failed to challenge Ivanov. The Royals were able to use a strong wind at their backs to create more chances in the second half, but both goalkeepers were stars of the half’s early stages. Ivanov made another fantastic save by denying the Menace another point blank opportunity within the first 10 minutes of the half. Kyle Ihn answered Ivanov’s save by winning a one-on-one opportunity against Truax in the 57′, who had been fed through the Menace defense by Admir Suljevic. Truax was close to scoring again after beating his opponent on a long kick by Ivanov, but his shot was once again denied by Ihn. Truax had another chance turned away after his shot was initially saved by Ihn in the 64′, but the ball fell back to the AFC Cleveland forward, whose headed ball was cleared off the line by a Menace defender. AFC Cleveland broke the tie in the 75′ after a foul on Cvecko, who was played into the right side of the box by Beck. Suljevic buried home the ensuing penalty kick in the 76′ past a diving Ihn. The Menace looked especially poised to equalize after the first goal and immediately countered with an attack that led to a shot off the Royals post, but the AFC Cleveland defense sorted through the chaos to send the ball away from danger. Hayden Partain brought the Menace back into the game with an equalizer in the 82′ after he was found open by Muang Sunday near the penalty mark and buried his shot past a diving Ivanov. Cvecko scored what proved to be the winning goal in the 90′ after Des Moines appeared to score when the ball hit the net after deflecting off the football post above the goal. Ian Larson possessed the ball along the left channel before delivering a well-placed cross opposite-field to Cvecko, whose shot soared over Ihn and off the far post before bouncing into the goal. AFC Cleveland got an insurance goal late into stoppage time when Beck dribbled past a Menace defender to create a 3v1 opportunity. Beck served a cross to substitute Reymar Klochko, who was left alone for the easy tap-in. This would be Klochko’s first goal as a Royal. 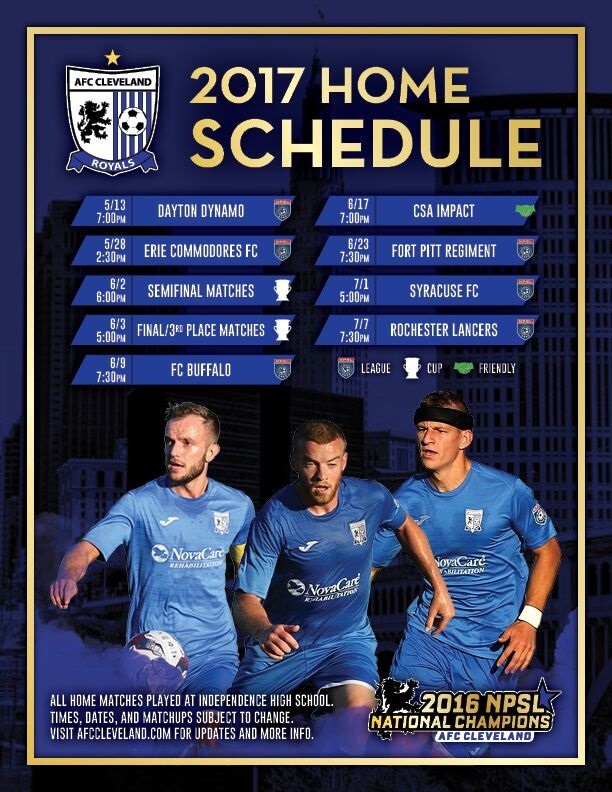 The Royals now await I-71 rivals FC Cincinnati in the Second Round of the Lamar Hunt U.S. Open Cup next Wednesday, May 17.